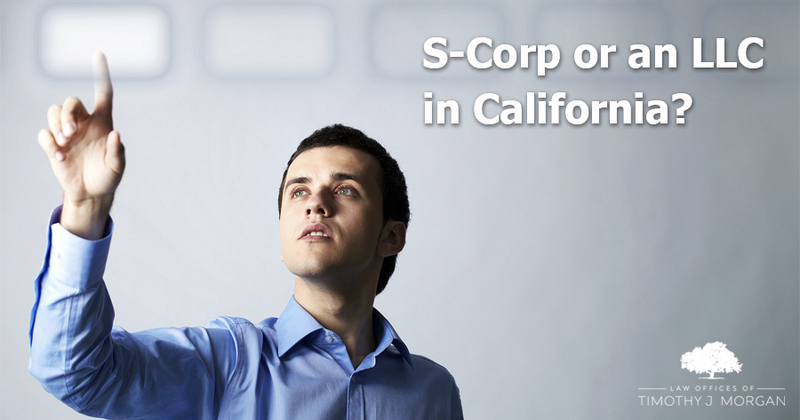 S-corporation or LLC in California. When a new business is deciding what type of entity to choose for formation, some may consider forming an S corporation due to its specific tax advantages. Unlike other types of business structures, the profits and losses from an S corporation can pass through the business to the shareholder’s personal income tax return, meaning that the business is itself not taxed. A shareholder who works at the S corporation must pay him or herself reasonable compensation for the work he or she performs. Reasonable compensation is what the person should be paid for the fair market value of the services provided. If the person is not reasonably compensated, the IRS may reclassify other corporate earnings as the employee’s wages. An LLC may elect to be treated as an S corporation in order to combine the benefits of the two structures as well. Unlike an LLC, only the wages paid to the shareholder are subject to the employment tax rather than the entire net income of the business. Any remaining income of the business is payable to the shareholder as a distribution and is taxed at a lower rate than are the shareholder’s wages. The S corporation exists independent of its shareholders, meaning that if a shareholder leaves, the business can continue to operate relatively undisturbed. Some cost may also be written off as business expenses although shareholders who own more than 2 percent of the business’s shares will have benefits. Entity selection is a very important consideration when starting a business. People may wish to consider several different structures prior to selecting one. Those who are starting businesses may wish to ask a business law attorney about the advantages and appropriateness of selecting an S corporation.